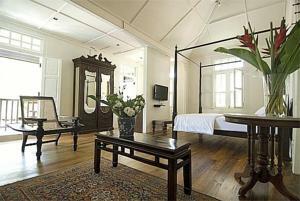 What makes the Seng Hout Hotel so Darn Good? "The Seng Hout is a new, tidy, and spotless hotel owned by a very proud owner and local man. 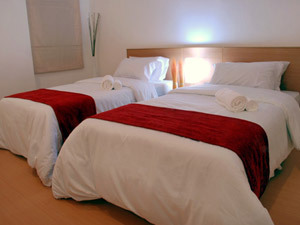 The rooms are cheap, and the hotel has a very friendly staff." What makes the Rikitikitavi so Darn Good? What makes Rikitikitavi so good is the service, which is simply the best we have ever come across in our travels through Southeast Asia! With their welcoming rooms, delicious food, and helpful suggestions for what to do around town, Denise, Dom, and their staff ensure that their guests are well taken care of throughout their stay. 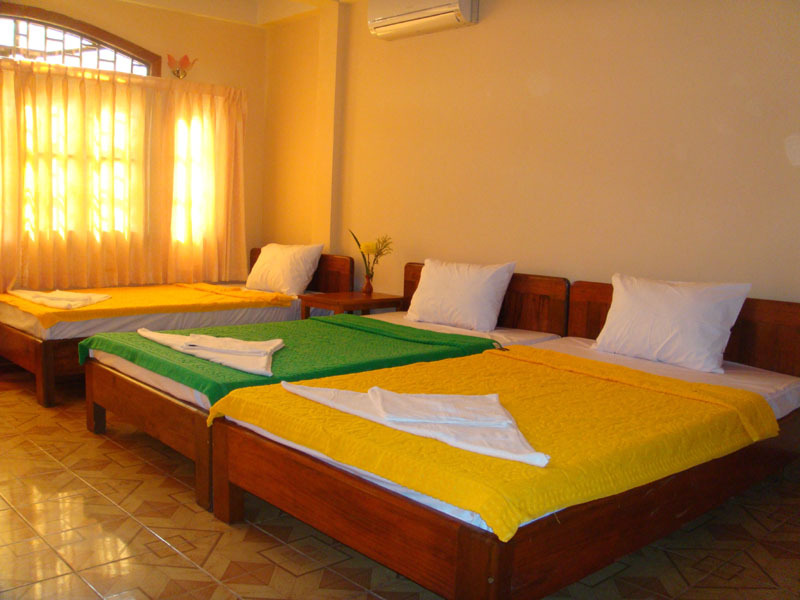 Rikitikitavi is spotlessly clean, comfortable, and quiet, and has a perfect location right on Kampot's riverfront. Location: A rich collection of colonial architecture and a riverside perfect for strolling make the small town of Kampot in southeastern Cambodia an appealing destination. Several beaches along the Gulf of Thailand, such as those of Kep and Rabbit Island, are nearby, but the area's biggest draw is Bokor Hill Station, a 1920's era retreat built by the French high up in the Elephant Mountains forty kilometers from Kampot. 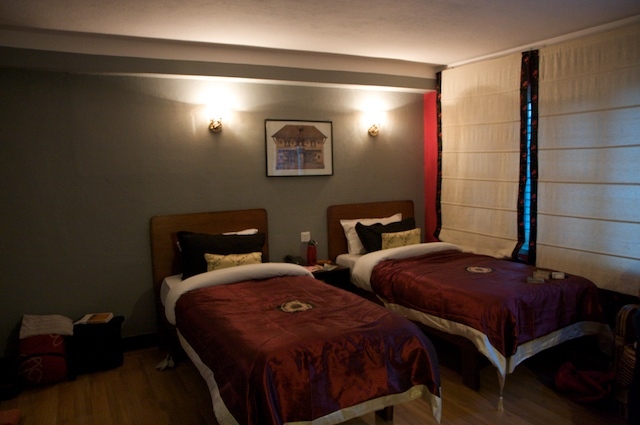 Rikitikitavi is on the town's Riverside Road, within walking distance to the taxi stand and bus station. Rooms: Situated in a renovated wooden-framed rice barn, Rikitikitavi has well appointed rooms decorated with Khmer silks and pillows, rattan furniture, and local art. The beds are comfy and the showers are hot. The Inn has an extensive DVD library so guests can watch movies on the DVD players in their air conditioned rooms. 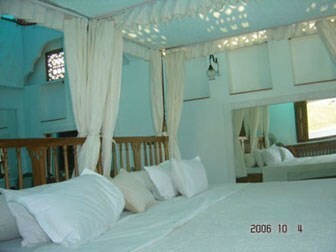 Double rooms have four poster beds and private patios. Food: Meals at Rikitikitavi are served on the rooftop restaurant and bar which has gorgeous views overlooking the river. The chef uses very up-market fresh food which is wonderfully presented and cooked to perfection. I highly recommend Beef Saraman! Breakfast includes baguettes, crepes, and fresh fruit salad. Vibe: Staying at Rikitikitavi is like visiting old friends, and this is one reason the hotel is so special. Whether in our room or upstairs in the restaurant, we felt incredibly welcome, comfortable, and relaxed. Keep in Mind: Book well ahead because this is a popular place. Also, make sure to reserve a table for dinner in the high season, and ask for Bory the tuk tuk driver. What makes the Blue Lime so Darn Good? 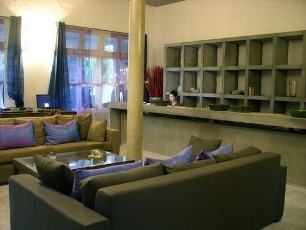 The Blue Lime is a quiet oasis right in the center of crazy Phnom Penh. 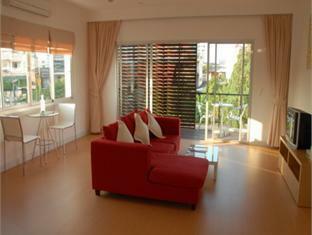 Our amazing room was very clean with a funky, modern design and concrete furniture. The hotel has an awesome saltwater pool surrounded by a tropical garden, and decked out with cabanas, day-beds, and a small bar. 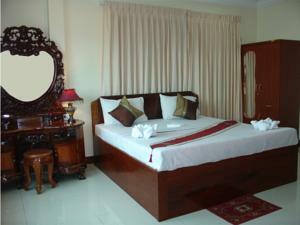 Location: The hotel is at the end of a small, quiet alley within easy walking distance to the National Museum, Royal Palace, and Sisowath Quay, the city�s riverside promenade lined restaurants and caf�s. In addition, tuk-tuks wait outside the hotel and are ready to whisk you away to anywhere you want to go in Phnom Penh. Rooms: The Blue Lime�s twenty-three beautiful rooms are accented with bright colorful silks, and are furnished with beds, desks, shelving units, and wardrobes, all constructed with molded concrete. Rooms have air conditioners and fans, as well as en-suite bathrooms with solar heated water. The reception area has computers with internet access, and rooms have a DSL wire to connect to your laptop. Food: A lovely breakfast is served out by the pool, and includes breads, eggs cooked to order, fresh fruit, and orange-passion fruit juice. Vibe: The Blue Lime has a friendly vibe and a helpful staff. Keep in Mind: Book ahead since this hotel is a very popular place. 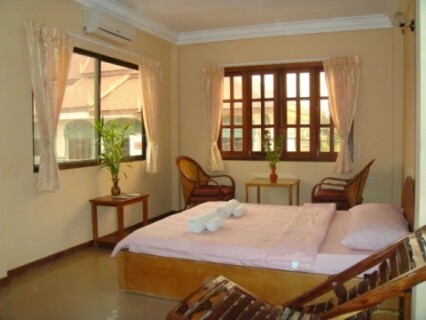 The hotel refers families with children under sixteen to its sister property, the Kabiki. Darn Good Digs Review - Editors' Choice - Full Review Coming Soon! Why so darn good? The 252's large, spacious rooms and friendly and helpful staff won me over. Gorgeous huts surround the pool for relaxing, enjoying a drink, or taking an afternoon nap! 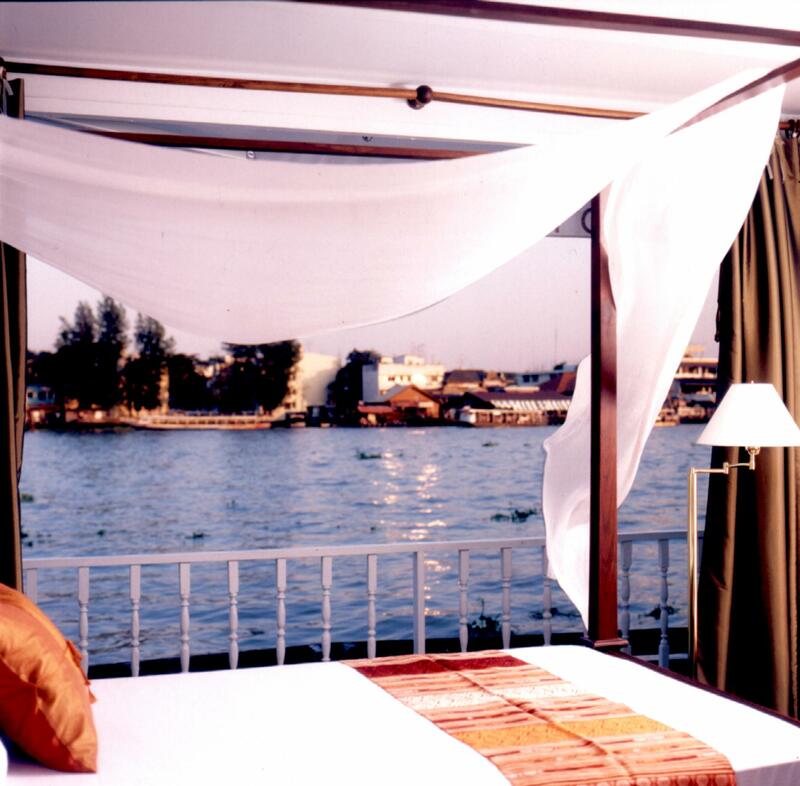 The hotel is a quiet and peaceful alternative to staying right by Phnom Penh's riverside. Please book through Darn Good Digs to support our one-of-a-kind website! Things to Keep in Mind: Journeys Within is ten minutes from town, so you can't just walk outside and wander about, but tuk tuks are readily available and are a great way to get to the heart of Siem Reap. What makes the Prohm Roth Guesthouse so Darn Good? 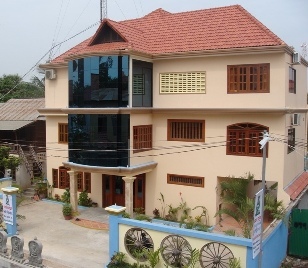 For $15 a night, we had a large, impeccably clean room in the heart of Siem Reap, within a two minute walk to Pub Street and its abundance of restaurants, bars, and shops. Prohm Roth is Khmer owned and operated and the customer service was the best that we experienced in our entire six months of traveling. Location: The guesthouse is on a side alley off of Pub Street in Siem Reap's Old Market area, and is fairly quiet except for Sunday mornings when the monks in the wat across the street begin chanting at 6:00 a.m. Travelers flock to Siem Reap to visit the magnificent twelfth century temples of Angkor Wat. Rooms: The guesthouse is in a brand new building and has twin, double, and triple rooms. Rooms are simply decorated and have comfortable beds, en-suite bathrooms, and cable television. While most rooms have air conditioners, the cheapest twin rooms only have fans. 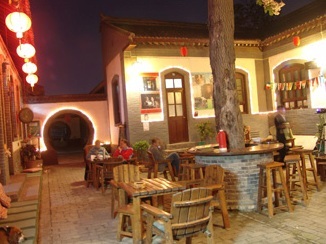 Food: The guesthouse does not have an on-site restaurant. Vibe: We appreciated the honest opinions from Meang, Prohm Roth's owner, about what to see and how to see it, and were impressed by the care and attention shown by his whole family toward the hotel and its guests. Keep in Mind: The brand new guesthouse stands in stark contrast to its poorer surroundings on the Pub Street Extension, and the alley is not illuminated, making for a dark walk home at night. What makes No. 9 so Darn Good? 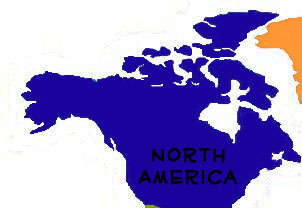 "No. 9 in Shanghai is my favorite place to stay in the whole world!" 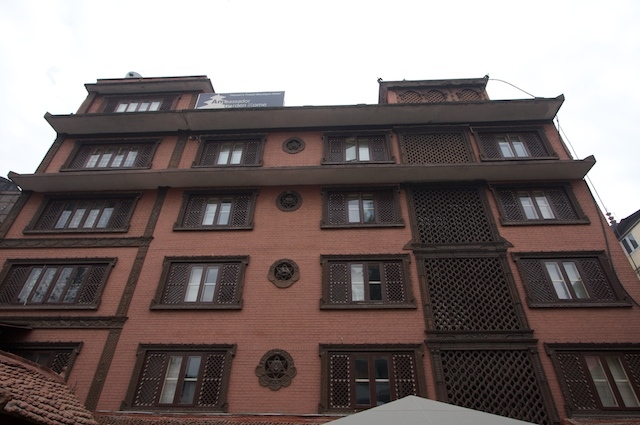 What makes Xi'an 7 Sages Hostel so Darn Good? "Finding a quiet location in the middle of a bustling city like Xi'an is a difficult task, but 7 Sages delivers this tranquility along with beautiful architecture and friendly service. 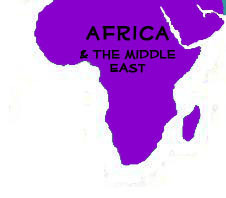 Part of the Hosteling International group, travelers can rest assured that a quality, family atmosphere awaits them." What makes the Yangshuo Secret Garden Boutique Hotel so Darn Good? "The Secret Garden is a beautiful and authentic hotel located in a gorgeous setting - right between Yangshuo�s famous karst mountains with rice paddies outside the front door. The buildings are 19th century farmhouses, stunningly renovated using local labor and full of original features. The owners and staff are super friendly as well, and went out of their way to make us feel welcome." 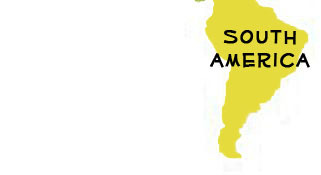 What makes Casa Susegad so Darn Good? 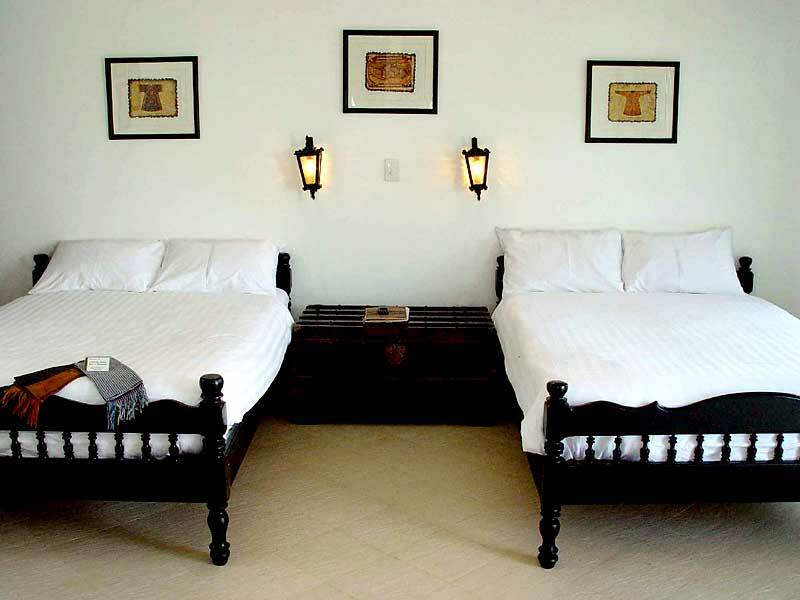 The incredible architecture and furnishings of this amazing 400-year old mansion, as well as the warm hospitality of the hosts and staff, make this getaway in beautiful coastal Goa like no other. During my stay at Casa Susegad, I was able to attain the perfect balance between relaxation, interaction with other guests and village neighbors, and short treks to nearby activities. 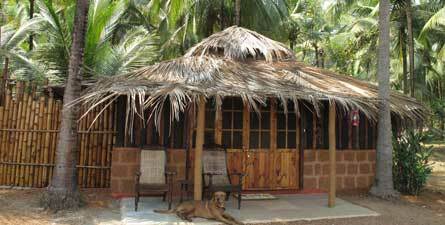 Location: Set on one-and-a-half acres of grounds in the sleepy southern village of Loutolim, Casa Susegad is surrounded by the forest and far removed from the mass tourism of Goa. 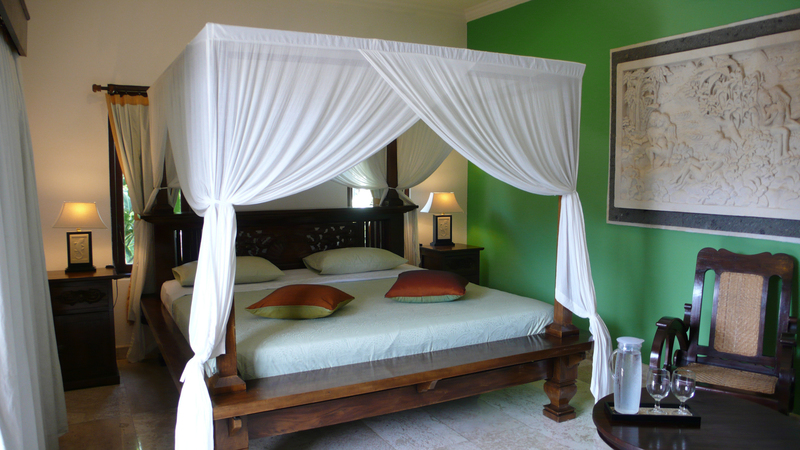 Rooms: A colonial mansion was completely restored to create this charming, historic four-room heritage guest house. The restoration was a labor of love for Norman and Carole Steen, who retained elements such as teak ceiling beams and the 400-year-old mosaic tile floors which are amazing in their intricacy. The four guestrooms are spacious and well-appointed with antique Indian furniture, deep-sprung mattresses, and en-suite bathrooms. Named after semi-precious stones found in each room's decorative floor borders, the rooms have color schemes that reflect the stone, including gorgeous hand-sewn patchwork quilts that cover the beds. 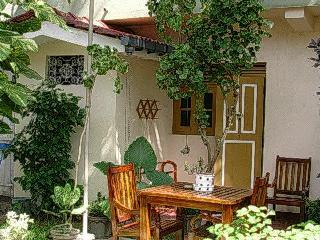 Each room opens up to its own terrace area with a table where breakfast or tea may be taken. While guestrooms are comfortable and inviting, the whole house is at guests' disposal. Cozy up in a cushioned corner seating area with a good book, lounge by the lovely pool, or stroll the beautifully landscaped grounds to the top of the ridge behind the house, from which a perfect sunset can be witnessed. Food: The four-course dinners at Casa Susegad are not to be missed. Food is a fusion of Goan cuisine and imaginative continental dishes. Carole often starts her day at the local market, and has worked painstakingly with her wonderful staff to prepare traditional local dishes as well as train them in her own recipes. Everything is organic and prepared in the large kitchen or over a traditional wood fire. You will never have the same dish twice; ask Carole about the Goan chicken or the incredible fish wrapped in a banana leaf. Your hosts will happily lead you on a tour of the kitchen and garden, pulling samples of the many fruits they grow right off the trees or a bite out of something cooking on the stove for you to try. 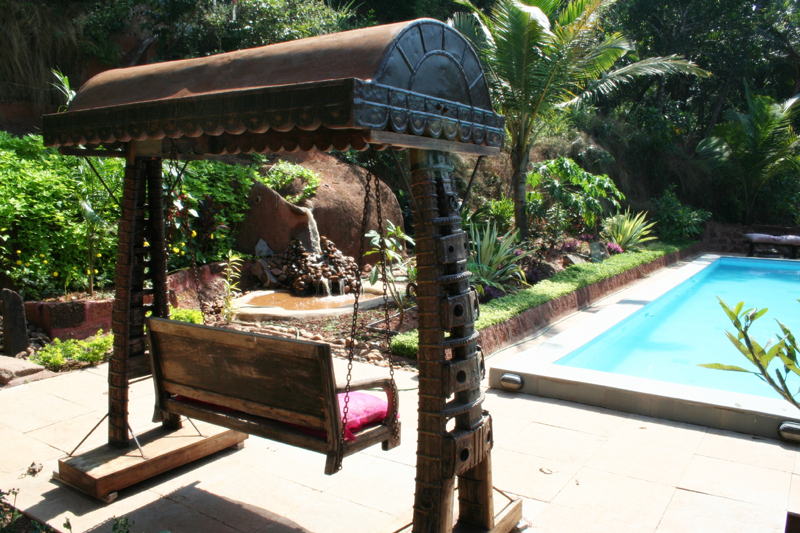 Vibe: Susegad has no direct English translation, but its many Goan meanings include contemplative, lazy and satisfied. The owners chose this name as a way to offer guests the opportunity to discover their own meaning during their escape to this peaceful idyll. Keep in Mind: The beach is a twenty minute drive away and no restaurants or nightlife are within walking distance. Also, the Steens have six dogs and several cats on their property, all rescued as part of their support for the Goa Animal Welfare Trust. What makes the Olaulim Backyards so Darn Good? We were collected from the airport and greeted at Olaulim Backyards by Pirkko, Savio, Manuel, and Shameena, as well as the dogs, horse, and donkey. We immediately felt at home and as if we had known everybody for years. The food and drinks are outstanding, the setting is spectacular with beautiful views across the lake and infinity pool, and the wildlife is incredible - a must-see for any twitcher! Location: Olaulim Backyards has a peaceful location on the banks of the Mandovi River in tiny Olaulim village, just a half hour but a world away from Goa's busy markets, beaches, and nightlife. Sitting by the river early every morning, we saw Brahamani kites, wild peacocks, great hornbills, and kingfishers in all colours and sizes. We also loved our morning walks and bicycle rides around the garden and village, where we were shown indigenous trees, given tastes of spices, and taught about the history of the area with its strong Portuguese influence. 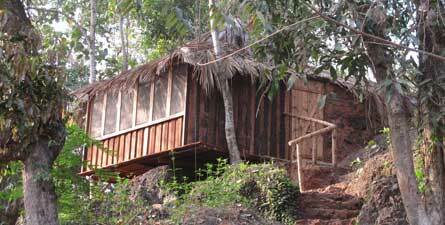 Rooms: All three of the eco-cottages at Olaulim Backyards are beautifully thought out and individually designed using reclaimed building materials. 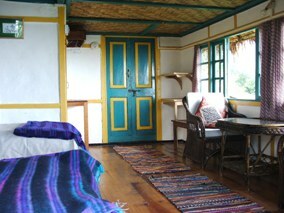 We stayed in the Sun Bird cottage which has comfortable beds and an open air shower heated by solar panels. 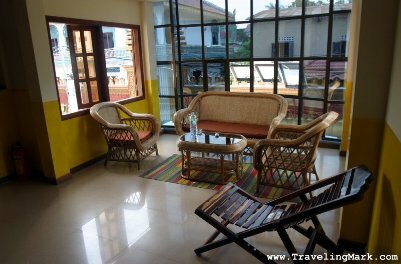 We also peeked at the other two cottages, the Horn Bill and the Golden Oriole, and they were both lovely with fantastic views of the coconut groves, paddy fields, and swimming pool. Food: The food and drinks are outstanding! Breakfast features tropical fruits such as pomelos, bananas, and coconuts fresh from the garden. For lunch and dinner, the traditional Goan cuisine is cooked on a wood-fire using seasonal vegetables from the local market as well as fresh fish and prawns straight from the lake. Vibe: Chilled, chilled, chilled. Our stay was so relaxing that four days felt like two weeks. This is truly a special place run by a special family. 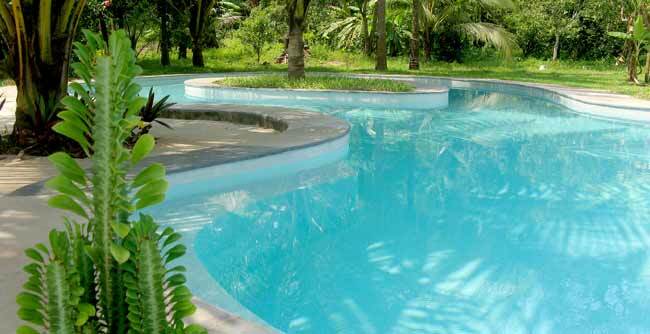 Keep in Mind: Olaulim Backyards has kayaks, canoes, and bicycles for guests to borrow. 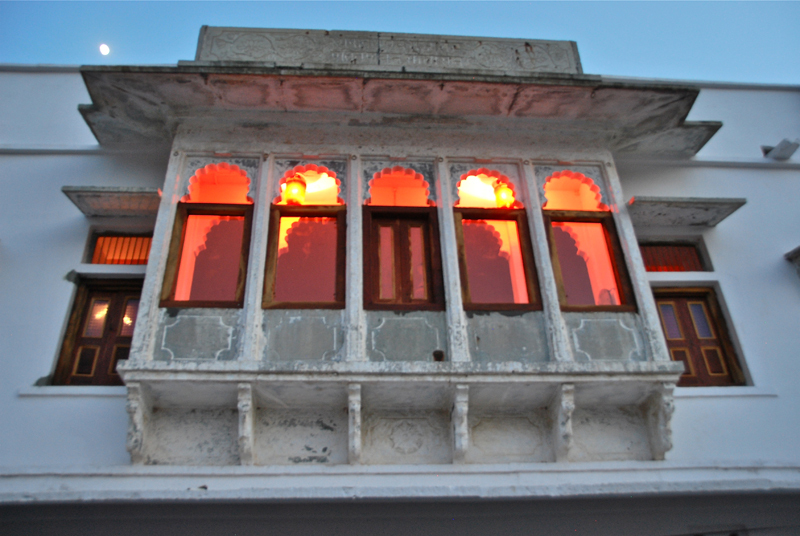 What makes The Padmini Haveli Guesthome so Darn Good? The two qualities that make this hotel so exquisite are its unbeatable location and the charming couple, Sudhir and Parvati, who own and run it. Location: To understand the incomparable location, one needs to understand that Chittorgarh is an eighth century fort set on a steep hill overlooking the town and surrounding countryside. The fort itself houses a small village of 4000 residents, and it is in the midst of their colourfully painted concrete homes and Shiva temples that the newly renovated haveli sits. Chittorgarh is located in the state of Rajasthan, approximately ninety kilometres northeast of Udaipur, and can be reached in two to three hours by car or train. 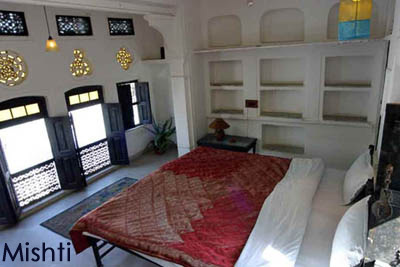 Rooms: The nine rooms in this brilliantly restored Rajasthani merchant�s house are beautifully decorated, the sheets are pristinely white with quilts from the Jaipuri-brand Anokhi, and the walls of every room sport stunning photographs of Chittorgarh. The owners have installed a cozy library with an abundance of coffee-table photo books and a heavenly rooftop terrace that boasts phenomenal panoramic views. 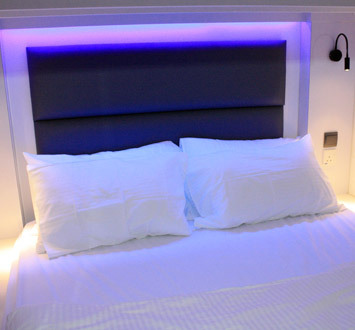 All rooms are complete with air conditioning units, heaters, and hot water. Food: The traditional Rajasthani food is one hundred percent vegetarian, delicious, and can be as spicy as you request. The menu is set and includes seasonal vegetables, lentils, and rice, accompanied by chappatis, puris, and parathas. The coffee is fresh and real (as opposed to instant! ), something I found hard to come by in India. In keeping with the family environment of this small hotel, guests often dine together at a communal table in the courtyard. Vibe: Very laid-back. Padmini truly embraces the rurality of this location. Borrow a mountain bike from the hotel and spend the day cycling around and exploring the area. Keep in Mind: With no restaurants or other hotels in the fort, Padmini Haveli is very much an escape destination. 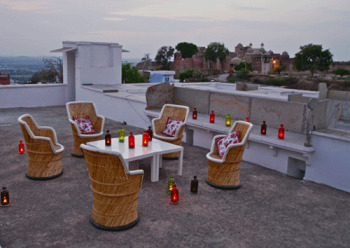 If you are looking for a buzzing hotel in a busy area, neither Chittorgarh nor Padmini are for you. 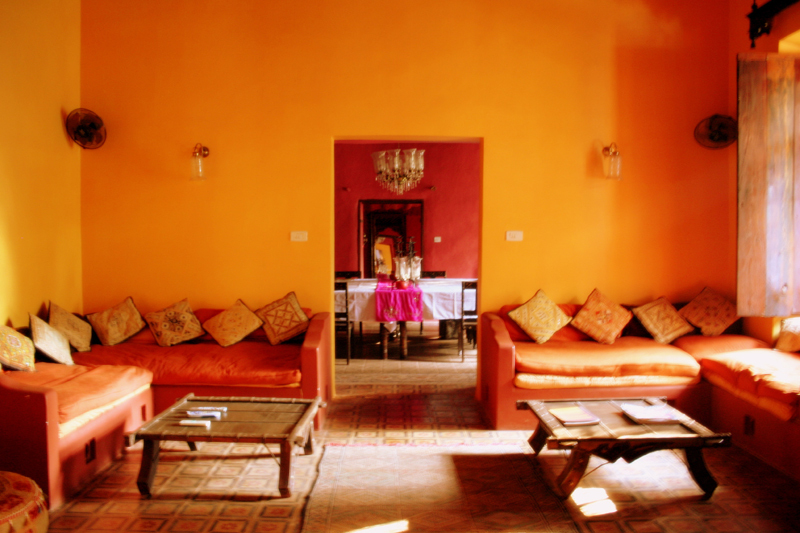 Instead, retreat to this beautiful Haveli which feels, in all the right ways, like a home from home. What makes the Inn Seventh Heaven so Darn Good? 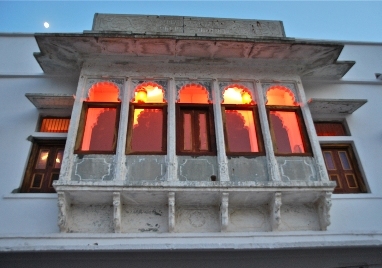 Seventh Heaven is a beautiful, old haveli with a lovely courtyard and fountain. The Inn is simply and stylishly renovated (not tissy), very clean, and comfortable (for non-Australian speakers, not tissy = not fru fru). 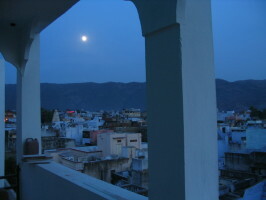 Location: Pushkar is one holy place. It is located in the northwestern Indian state of Rajasthan, and is one of five sacred Hindu pilgrimage sites. The town sits on the shore of Pushkar Lake, considered the holiest lake in all of India, and has 52 ghats where pilgrims enter the lake to bathe in its sacred waters. Pushkar is also home to the world's largest Camel Fair, a festive time when the town is flooded by musicians, magicians, acrobats, and snake-charmers. 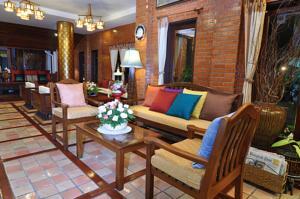 Inn Seventh Heaven is just a short walk to the lake and town center. Rooms: Seventh Heaven has 12 unique rooms, which range in quality from the two ground level windowless rooms to the most fancy rooftop room, the Asana. 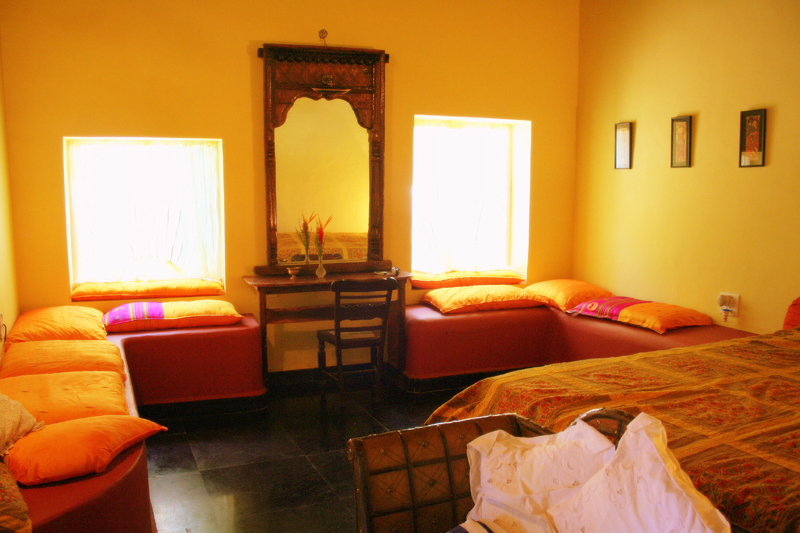 The rooms are situated around a traditional courtyard, bedecked with a fountain, fruit trees and chairs for chilling. Food: Amazing. 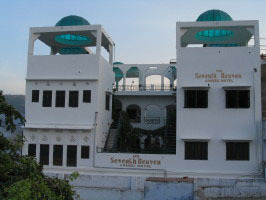 Seventh Heaven's rooftop restaurant, the Sixth Sense, serves both Indian and Continental food. This hip joint is filled with sofas and lounge chairs for lounging. 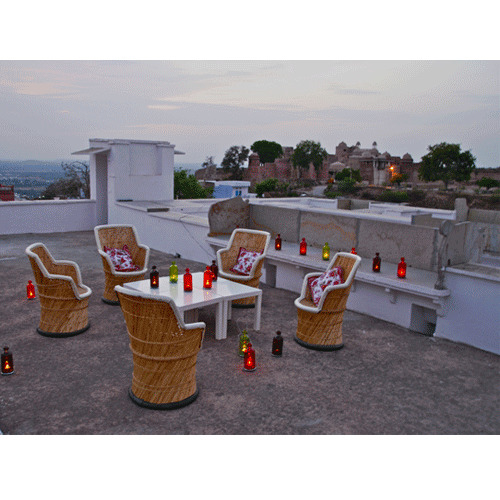 Guests are treated to panoramic views of Pushkar and the desert mountains in the distance. And just so you know - Pushkar is totally vegetarian and alcohol free. Vibe: Seventh Heaven has a chilled out, modern hippy kind of vibe. Things to Keep in Mind: Some of the Inn's rooms are fairly basic, and if you prefer a room with windows, AC, or heat, make sure you ask. 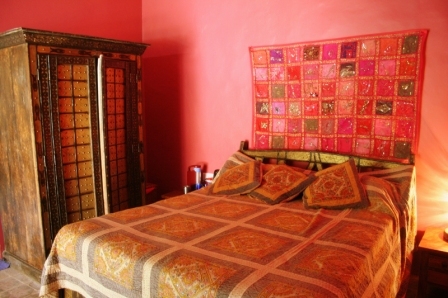 Book ahead because these rooms fill up fast, especially during the Camel Fair. What makes the Karmi Farm so Darn Good? A stay at Karmi Farm is far from your typical homestay. 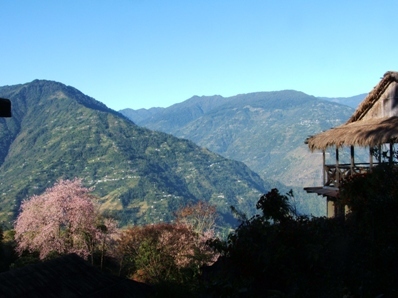 Here, guests can go trekking or bird-watching in the magnificent mountains, participate in one of the art retreats or yoga clinics held at the farm throughout the year, or volunteer at the farm's own medical clinic which offers free and low-cost treatments to villagers, many of whom walk hours for care. 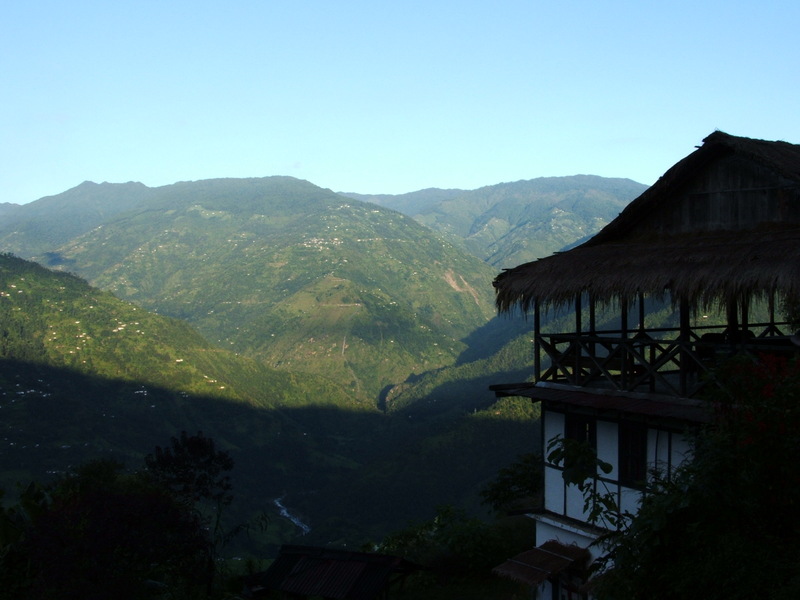 Location: Karmi Farm is in the northern part of the Darjeeling District of India, tucked away between Nepal and Bhutan in the Himalayan foothills. 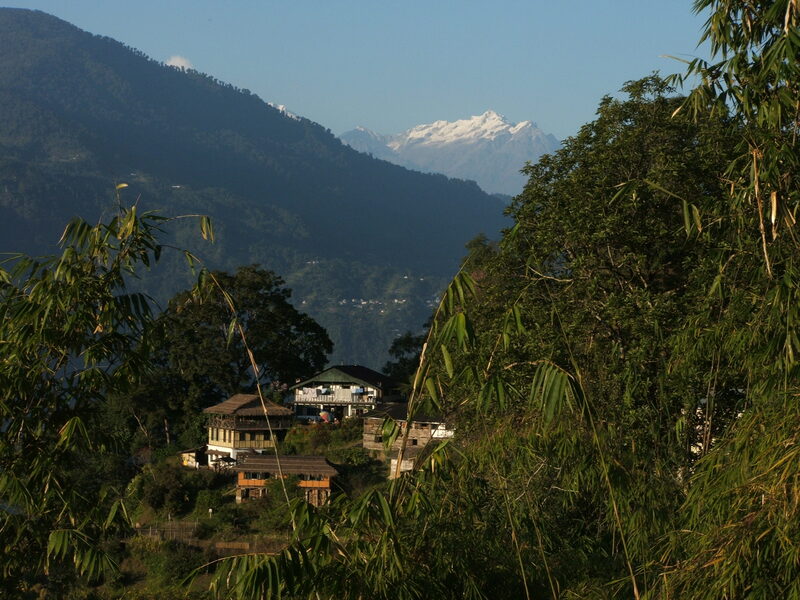 Getting to the Farm takes real dedication; after flying into Bagdodgra airport or taking a train to New Jalpaiguri station, you must take a five hour car ride along steep, winding, bumpy mountain roads to the Bijanbari area where Karmi Farm lies. Once here, you feel quite apart from the rest of India, as the language, food, and customs are all more Nepalese than Indian. 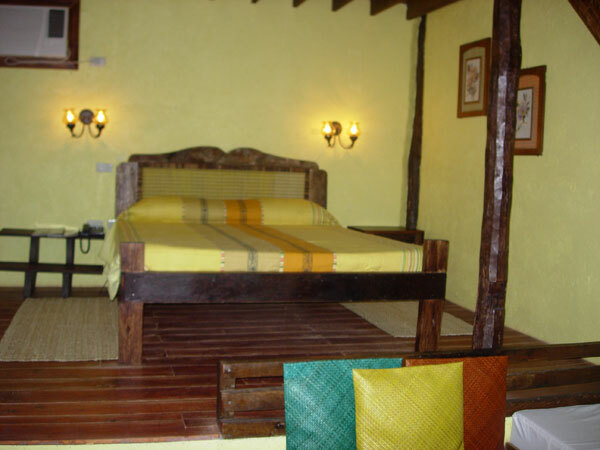 Rooms: The farm has guestrooms in the main house as well as in separate thatched-roof cottages, each one simple and comfortable with two twin beds and tables with low chairs. While rooms are fairly rustic and lack heating or air conditioning, they do have electricity and bathrooms with hot water (though some bathrooms in the main house are shared). 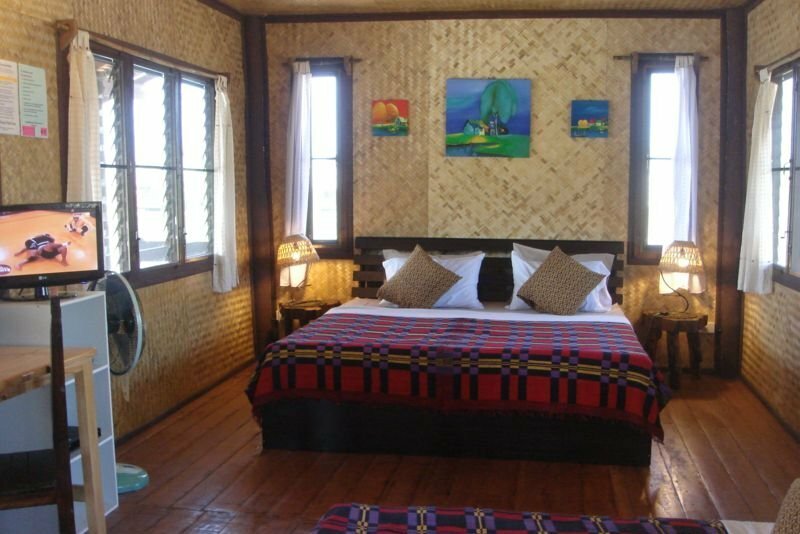 For groups or travelers on even more of a budget, Karmi Farm has recently added a dorm-style room that can accommodate six people. The main house has two living salons where guests can relax while reading books, playing games, watching movies, or listening to music. Both salons have a fireplace, which is delightful to sit by on chilly nights. Food: Meals (organic, vegetarian, plentiful, and delicious!) 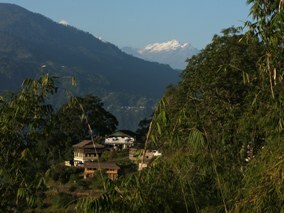 are taken either in the kitchen or on the lovely thatch-covered deck overlooking the Himalayas. Dishes are a combination of Nepali, Chinese, and Indian cooking and include curries, paneer, and noodle soups. The farm also has an honor bar where guests can grab their own wine, beer, or liquor. Given the remote setting, almost all of your meals will be had at the farm, and in this informal setting guests quickly get to know each other, as well as the staff, many of whom have been with the farm for years. Vibe: Arriving at Karmi Farm, you realize this family home is very much a part of the surrounding villages and has been so for decades. Andrew Pulger-Frame currently runs the farm with the help of his mother, other family members, and their warm and accommodating staff. Andrew's knowledge of the area is impressive, as is his commitment to the community. He has many a great story to tell about his family and the history of the region. Keep in Mind: Given the farm's stunning and secluded location, be prepared to relax (bring books!) and get back to nature (bring good walking shoes!). Also bring cash. 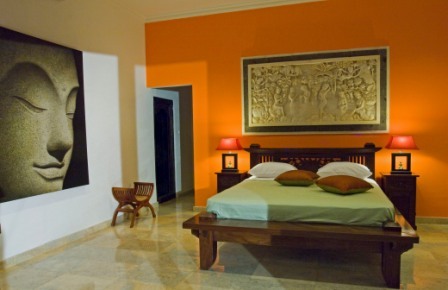 What makes Balam Bali Villa so Darn Good? 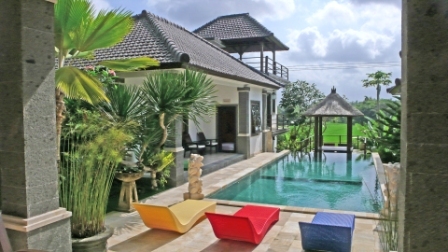 Having lived and traveled overseas for twenty years, I can say without hesitation that Balam Bali Villa is the best of the best! I cannot praise Adi, the manager, and Hubert, the owner, enough on their personal attention to every detail and the extra care that they show every guest to ensure a memorable experience. The location is stunning, the villa and its rooms are gorgeous, and the food is fresh and delicious. Location: Balam Bali Villa is surrounded by lush green rice paddies in the heart of Bali�s serene and beautiful countryside. The sacred temple of Taman Ayun is close by, and the town of Ubud, considered by many to be Bali�s cultural center, is a half hour away. While guests could easily wile away the day lounging by the pool or getting an in-house massage, Balam Bali offers several excursions around the island for when the mood hits. 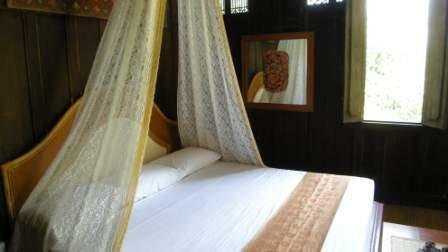 Rooms: Balam Bali has three rooms in a genuine seventeenth century pirate�s lair imported from the island of Sulawesi. 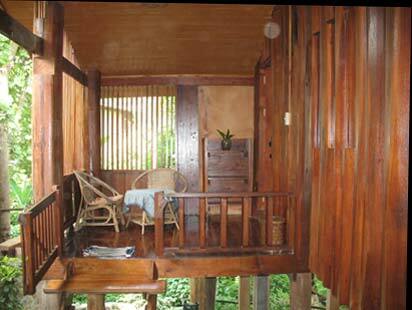 The house is built of native teak and its soothing teak-furnished rooms are beyond exquisite. In addition to the House of Pirates, Balam Bali offers five stylish rooms surrounding a pool in its Villa of Marbles. 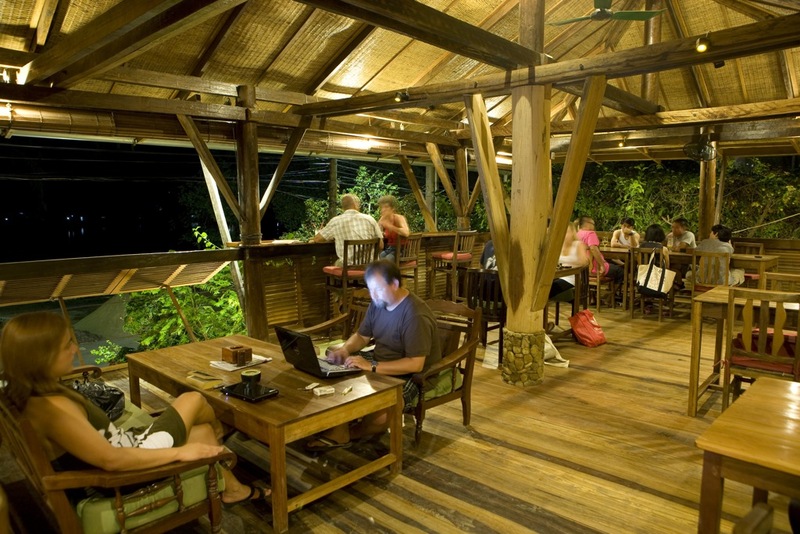 Food: Balam Bali serves fresh, made to order French and Balinese cuisine. Meals can be enjoyed on the terrace overlooking the rice paddies or at the Villa�s on-site restaurant. Vibe: Peace out. This small, intimate villa is totally chill, and the gracious staff is very accommodating to couples, singles, and families alike. Keep in Mind: For two hours of bliss, don't miss the complimentary rice paddy and village walk with Adi or Hubert! What makes Taman Sari Bali Resort and Spa so Darn Good? "It is simply one of the loveliest places we've ever stayed. Bali is, of course, amazing anyway, but this little property is beautifully landscaped, on the Java Sea, and very private. The food at the on-site restaurant is also delicious. The staff couldn't be nicer, and terrific massages are also on site. The best snorkeling is off a nearby island." What makes the Aryani Resort so Darn Good? This place is incredible. 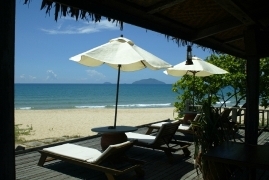 The Aryani is on a fabulous white sandy beach that stretches for miles on the South China Sea. 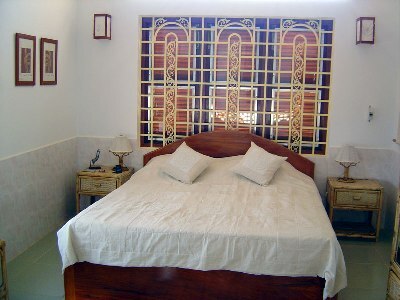 All rooms are in separate bungalows designed in a very Malay style with outdoor bathtubs. Location: Guests at the Aryani can view lovely islands in the distance and funky commercial fishing boats just off shore. The resort is in the state of Terengganu on the northeast coast of peninsular Malaysia near the small village of Merang. Ferries leaving Mereng will take you to the Redang and Lang Tengah Islands, both part of the Terrangganu Marine Park and known for their excellent snorkeling and scuba diving. Kuala Terengganu, 45 minutes away and the closest city to the resort, is a center of Malay culture, crafts, and cuisine. 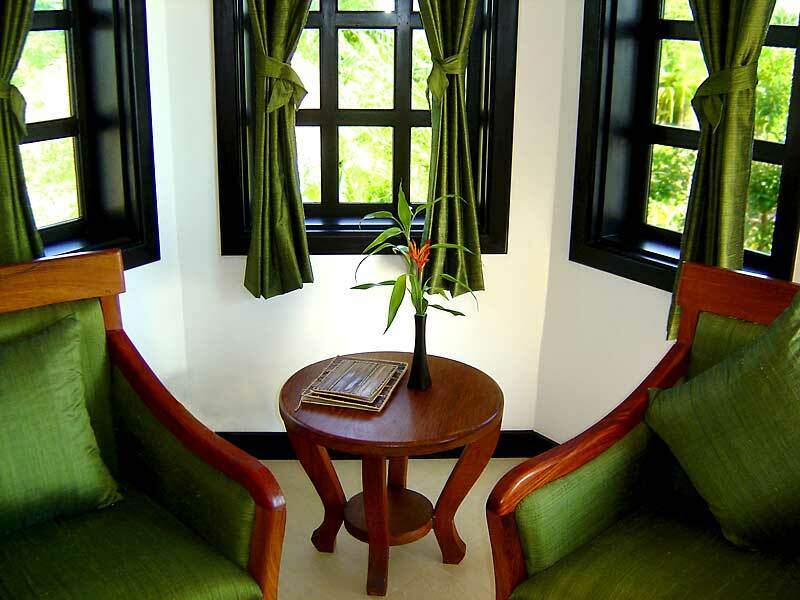 Rooms: The Aryani bungalows are incredible, all with a very Malay style and design. 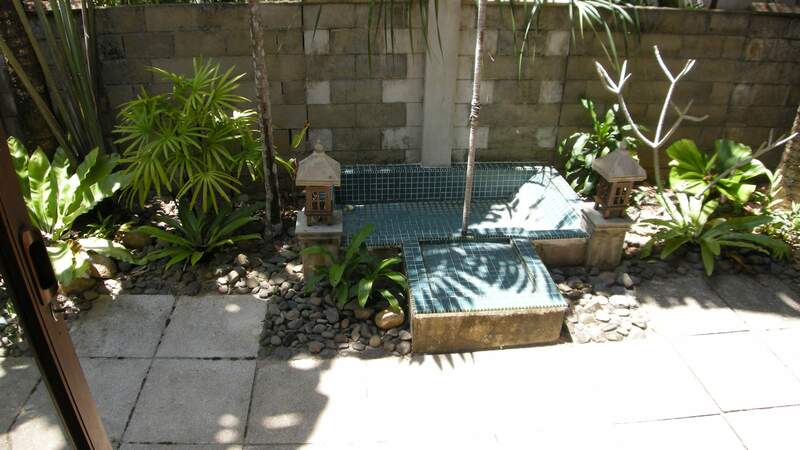 Each room has the normal hotel amenities, as well its own little private yard with a sunken bathtub and shower. The resort's architect and owner has created the Aryani in the image of a traditional Malay royal settlement, even relocating parts of a 19th century royal palace to house its spa and Redang Suite. Food: The Aryani has two restaurants, the Serai Restaurant and the Pulau Beach Club, both serving Malay and Western dishes. Those with a sweet tooth will enjoy the sweet treats served every evening. 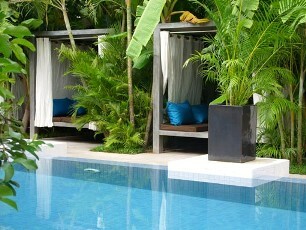 Vibe: The Aryani is very Malay, very quiet, very secluded, and very laid-back. The staff is wonderful and extremely helpful. Spa enthusiasts can indulge in traditional Malay massage and body treatments made with local fruits, flowers, and herbs. Things to Keep in Mind: The prices listed on the internet are high but we have been able to get them for a fraction of the cost by booking directly just before arriving. What makes Clove Hall so Darn Good? "Clove Hall features the same exquisite designer touch behind the multiple award-winning Galle Fort Hotel in Sri Lanka, coupled with friendly personal service. The hotel is located in a quiet residential neighborhood that is walking distance from both colonial downtown and the nightly street food area." Read more. 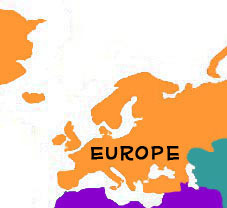 See the map. What makes the Ambassador Garden Home so Darn Good? 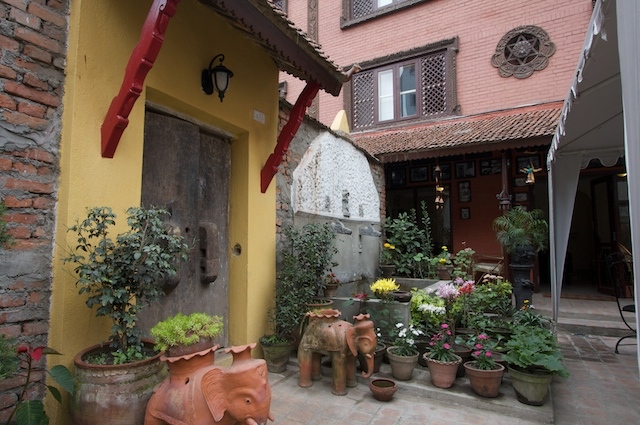 In the middle of the craziness of Thamel, Kathmandu's bustling tourist district, sits this gem boutique hotel. What made staying here so unforgettable was the staff who made me feel as if I were a member of the family. The owners called me by my first name and frequently joined me in the garden, assisting with any travel needs I had and introducing me to other guests at the hotel. 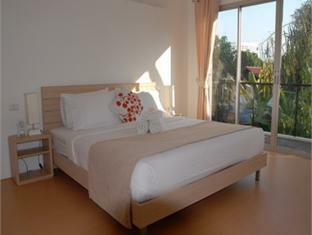 Rooms: The entire hotel has been recently renovated, and its eighteen modern rooms are decorated with class. Cultural and family relics can be found throughout the hotel, including the wooden garden doors and an old wooden staircase in the lobby. 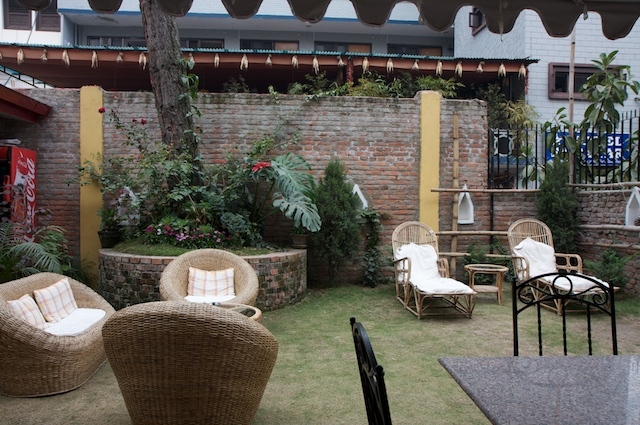 Surrounded by a classic brick fence, the Nepali garden is one of the hotel's highlights. Here guests can eat meals or simply relax reading a book with the fountain dribbling in the background. Food: The Ambassador Garden Home has an on-site restaurant serving breakfast, lunch, and dinner. The dhal bhat plate, Nepal's most popular dish, was fabulous. Breakfasts were also great, and I personally loved the French press coffee brought to the table! What makes Bohol Bee Farm so Darn Good? "As their website describes, the Bohol Bee Farm is literally a "sanctuary hidden from the world." Imagine yourself lying in a hammock surrounded by lush green and tropical flowers, overlooking the bluest body of water your eyes have ever seen. Close your eyes and sip on an organic avocado shake. Wander through the on-site farm, and then cool off in an outdoor shower (also overlooking the ocean)!" What makes Nuts Huts so Darn Good? "The motto of Nuts Huts is 'Go Native in a Great Place to Stay' and the Nuts Huts folks are true to their word. They market themselves as a 'laid-back centre for adventurous travelers, both keen on active life and relaxation.' During the day, you can take a jitney ride around the Island, maybe hike the Chocolate Hills, or paddle over to the tarsier monkey sanctuary. 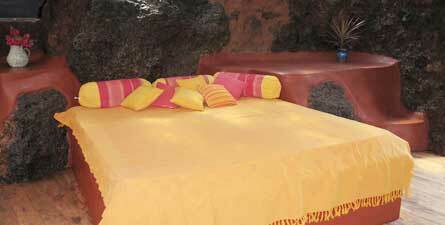 At night, chill out with an on-site massage and a fresh squeezed mango juice." What makes Wink Hostel so Darn Good? 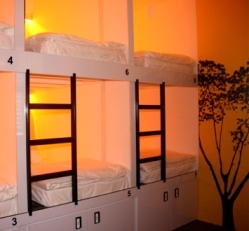 Wink has a perfect location in the heart of Chinatown, convenient by mass transit to just about anywhere you want to go in Singapore, but what makes the hostel so cool is its modern and high-tech take on the bed-pod concept. The staff is friendly and helpful, the atmosphere is peaceful and laid-back, and the rates for this level of quality in this part of town are fantastic. Location: Wink is just a few minutes from the Chinatown Mass Rapid Transit station, but linger in the neighborhood and you can learn some history at the Chinatown Heritage Center, visit a Buddhist temple, or pick up some souvenirs at the vast Night Market. When you are finished shopping, take a short walk to Clarke Quay, a hotspot for Singapore nightlife. Rooms: Located in a historic shop house gone modern, Wink departs from the ubiquitous hostel bunk bed with its sleek yet cozy bed pods. Pods have sound-resistant walls, and boast 260 thread-count sheets, orthopedic mattresses, and cushy backrests. Upon arrival you are equipped with a personal smart card which allows you to access your dormitory, your locker, and the entertainment lounge. Wink offers two mixed singles and one ladies-only dormitory, as well as a selection of queen-sized pods. Food: A do-it-yourself breakfast of toast, peanut butter and jelly, cereal, and juice, is included, and the staff will happily point you in the right direction for some cheap and tasty eats. Of course, Chinatown has no shortage of options with the Chinatown Night Market just around the corner and a multitude of hawker stalls in the various food centres throughout the neighborhood. Vibe: Wink has a relaxed atmosphere, doesn�t feel overcrowded, and is run by a group of wonderful, helpful people. Keep in Mind: Wink only has shared bathrooms, but they are kept clean and have rain-shower showerheads. What makes the Icebear Guest House so Darn Good? 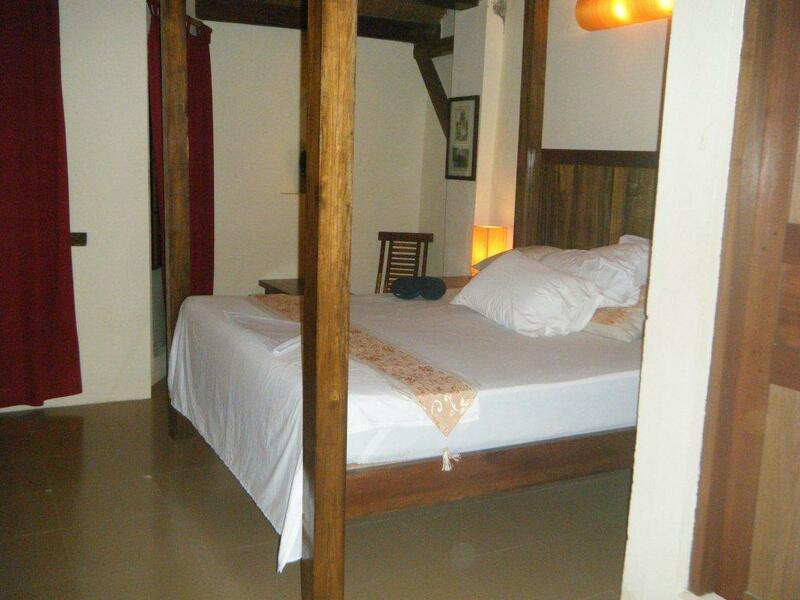 "The Icebear is the Sri Lankan dream digs. It is peaceful, private, and on the beach. The charm of this spot glows day and night. With Ayuverdic massage on-site, it's impossible not to relax at the Icebear." What makes Ibrik by the River so Darn Good? 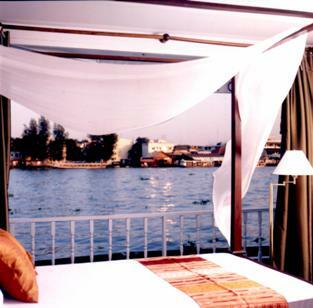 "Ibrik by the River is a simple but stylish guest house in a peaceful, convenient location right on the Chao Phraya River. Only three guest rooms means privacy and quiet, and the staff is incredibly polite and helpful. This little spot is like a home away from home in sprawling, bustling Bangkok, and a welcome respite at the end of a long day of sightseeing." What makes the Sri Pat Guest House so Darn Good? "These digs, in this neighborhood, are luxurious for a relatively small price. Other places were bare boned, concrete boxes with a shower head in the middle of another box called the bathroom. It is very easy to see that some effort, thought, and love had gone into the Sri Pat. The owners understand what weary travelers need and want, and they go the extra mile to deliver. 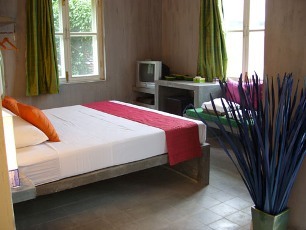 My daughter and I stayed at Sri Pat for one month and had a great time." What makes Studio 99 so Darn Good? Studio 99�s modern and comfortable apartments are in a residential area just a five minute walk to Thapae Gate and Chiang Mai�s old city. The building has a security guard, which I appreciated, and the staff is helpful and polite. 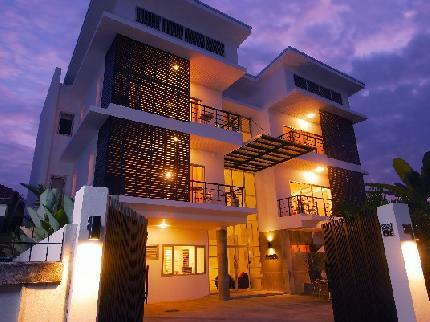 Location: Set on a quiet soi, or side lane, just off the main road leading to the old city�s eastern entrance through Thapae Gate, Studio 99 is within easy walking distance to many of Chiang Mai�s greatest attractions. Wander the old city�s winding streets, shop at the bustling Night Bazaar, or visit one of the hundreds of Wats, or temples, honoring Buddha throughout the city. Chiang Mai is also a popular starting off point for treks up north and is easily reached by train, bus, or plane from Bangkok. 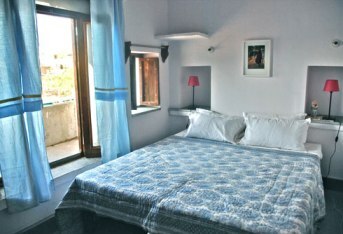 Rooms: Studio 99 has six spacious and very well-kept apartments with either one or two bedrooms and en-suite bathrooms. All apartments have balconies overlooking the street or courtyard garden, air conditioning, kitchenettes, and lounges complete with televisions and DVD players. Food: Studio 99 does not serve food, but guests can cook their own meals in their kitchenettes. 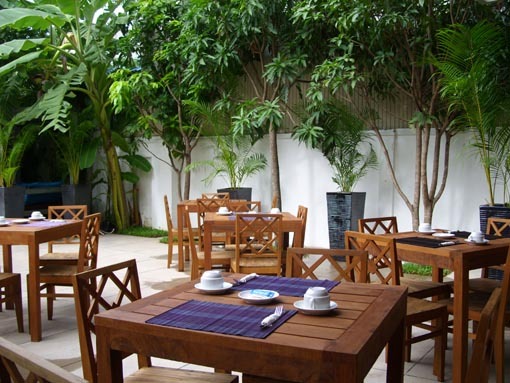 Several nearby guesthouses offer good affordable breakfasts, and plenty of tasty restaurants are within walking distance. Keep in Mind: Studio 99 has three floors but no elevator, so if you need a ground floor room, make sure to ask for one. What makes Bueng Pai Farm so Darn Good? A true gem - we never wanted to leave this little piece of heaven on earth! 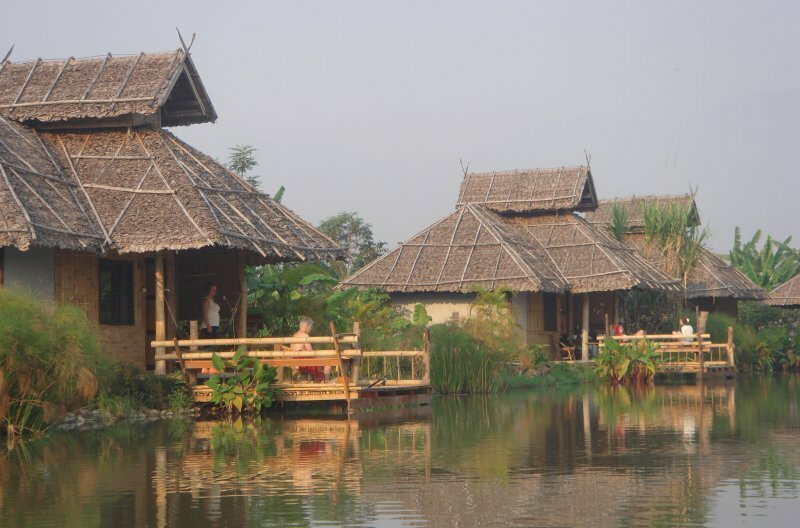 Surrounded by rice paddies in a gorgeous mountain valley, the farm has private bungalows overlooking a quiet fishing pond where guests can fish right from their hammocks. When not exploring the countryside, we spent our days fishing, relaxing in the farm's open-air island library, and swimming in the farm's natural, chemical-free swimming pool - complete with little fish to tickle your toes! Your hosts, Run and Orn, are absolute angels � kind, helpful, and fantastic cooks to boot. I felt so absolutely cared for and rested in this Pai-adise. Location: The farm is set among rice paddies along the lazy Pai River two and a half kilometers outside of Pai, a laid-back backpacker town with a lively music and restaurant scene. 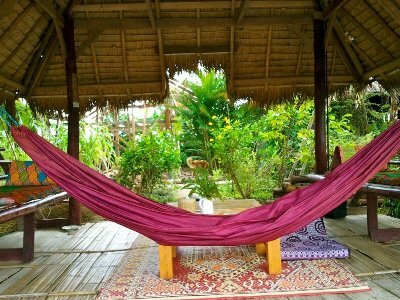 When not lazing in your hammock, you may want to take a bike ride through the countryside, go tubing down the Pai River, or check out the nearby hot springs and waterfalls. Pai is a popular starting off point for elephant treks through Northern Thailand and can be reached by bus from Chiang Mai, eighty kilometers away, or by plane directly to Pai. 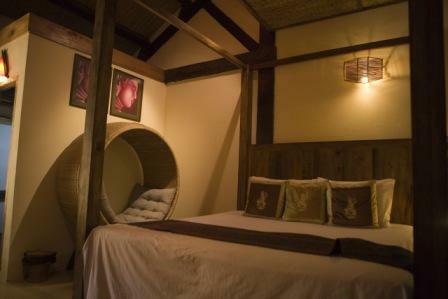 Rooms: Bueng Pai Farm's fourteen bungalows, all traditionally designed and built using local, natural materials, are immaculate with en-suite bathrooms, hot showers, and free WiFi. Many of the bungalows are right on the pond, yet the ones set back from the water are also wonderful as they have gorgeous views of the rice fields to be enjoyed from your veranda. 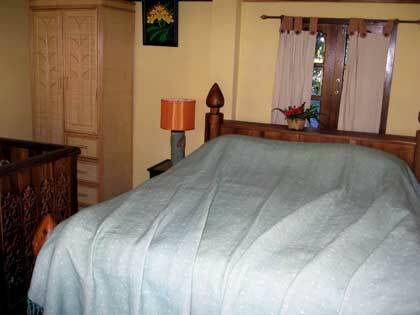 The bungalows range in size to accommodate single travelers as well as families. Food: Better than mom's! Run and Orn cook up delicious and nutritious vegetarian breakfasts such as home-made toasted muesli with yogurt, omelets cooked and served on a banana leaf, and chocolate pancakes. These and other delicious dishes and drinks are served with a smile � everyone at the farm is wonderful at making you feel at home. 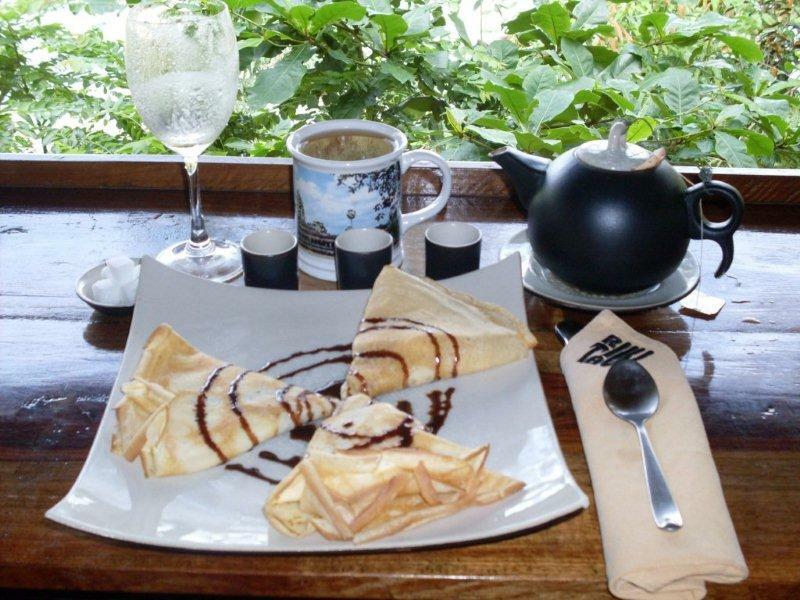 For lunch and dinner, the farm has a fully equipped guest kitchen, and the nearby town of Pai has plenty of restaurants with tasty food from the world-over. Vibe: The beauty and tranquility of Bueng Pai Farm are mesmerizing. I loved sitting on one of the shady decks watching the fish in the pond leap for joy and at night listening to the frogs in the rice fields sing me to sleep. Keep in Mind: The Farm is a couple of kilometers out of town so you may need a bicycle, motorbike, or car to get around. The walk to town is doable though, and you get to enjoy the spectacular scenery along the way. What makes Soppong River Inn so Darn Good? Going to the land of zzzz's on an excellent bed in a room with open eaves poised high above the chattering river after an excellent Thai spread in the Soppong River Inn restaurant is one of my lingering memories of the fabulous Mae Hong Son province. In ten years of wandering through Thailand, my favourite bed and breakfast or hotel has to be the Soppong River Inn. I score it a 10/10 for location, atmosphere, food, and service. Location: The Soppong River Inn is located in Soppong, a small village in the mountainous Mae Hong Son province near the Burmese border, 130 km northwest of Chaing Mai. Soppong has a lively market every Tuesday, when hill tribe people journey down from the mountains to shop and sell their goods. If you are in the mood for some outdoor adventure, the Inn is a perfect base for caving, kayaking, rafting, and trekking. 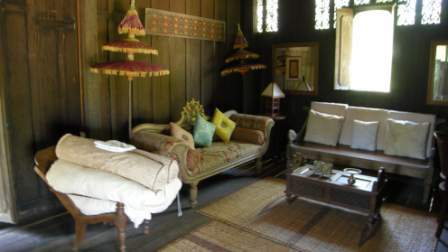 Rooms: The rooms and cottages are different styles, but all are made using traditional materials such as teak and bamboo, and all take their cues from traditional and modern Thai architecture. 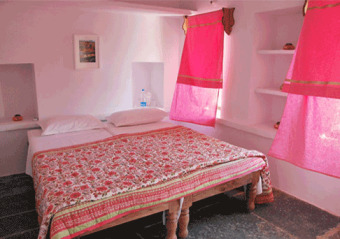 All rooms have cotton sheets and towels, en-suite bathrooms, and hot water. 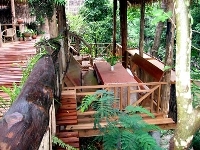 Some of the rooms have balconies overlooking the river, gardens, and rainforest. Food: The Inn's Seven Elephants Caf� serves a choice of Thai, American, or European style breakfasts, all with a super-fresh tropical fruit salad. Coffee drinkers will be psyched about the Inn's espresso machine, the only one for miles around. The dinner menu includes both Southeast Asian (even some local Shan specialties) and western style meals. 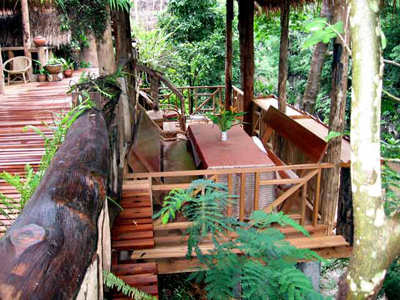 The restaurant has both indoor seating and an outside deck perched above the river. Vibe: Every time I've been back, Burt and Joy, the owners, seem to have improved the place even more, though how it's possible amazes me. Things to Keep in Mind: It's a bit of a trek to get to Soppong, but the roads are good and the flights from Chang Mai are short. What makes the Haad Tien Beach Resort so Darn Good? "This is our favorite beach resort EVER! We don't know how the resort does it, but there is a gentle breeze at all times of the day - from early in the morning until late at night - so it is a joy and pleasure to spend your days lounging on the sumptuous oversized outdoor beds and lawn chairs while overlooking the crystal clear waters, craggy coastline, and the sharks that roam through the bay in the early morning." 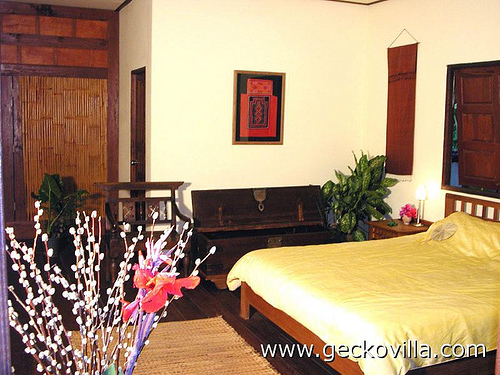 What makes Gecko Villa so Darn Good? Located bang in the middle of rice paddy fields and sugar cane plantations, Gecko Villa is a green oasis far from Thailand�s tourist trails. The two things that truly made our stay were the superb food, and the kindness and welcoming nature of the local host family and villagers. Having our own pool was a definite plus! 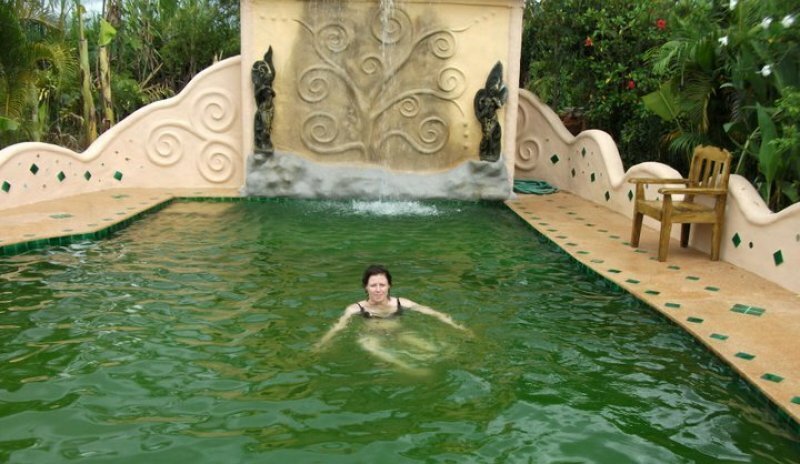 Location: Gecko Villa is located in Northeast Thailand�s Isaan region, fifty minutes by plane or nine hours by train from Bangkok, and not far from the Laos border. The province, Udon Thani, is home to the UNESCO World Heritage archaeological site, Ban Chiang, and its national museum which displays locally excavated artifacts and pottery dating as far back as 7,500 years. If that doesn�t float your boat, guests at Gecko Villa can take a boat ride among lotus flowers in the nearby lake, and all around are opportunities for exploring the villages, temples, and farms of bucolic Thailand. 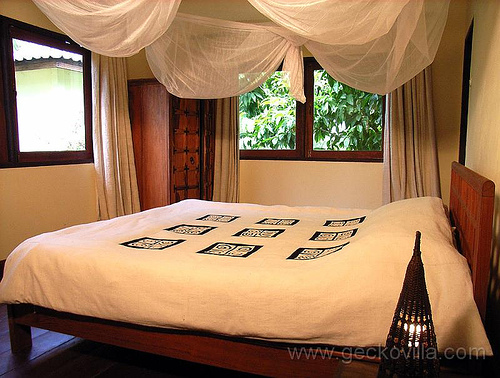 Rooms: Gecko Villa is a northern Thai-style country house with a pool that you rent all for yourself! 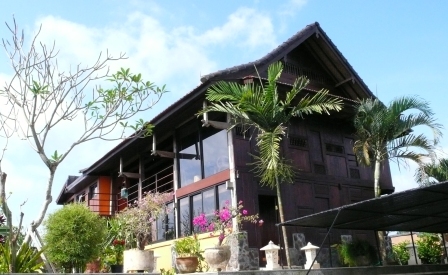 The Villa�s three bedrooms, large living and dining rooms, and fully equipped Western and Thai kitchens are in separate buildings and are connected by covered wooden verandas surrounding a garden. 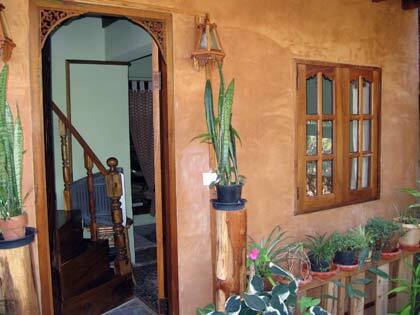 Traditional wooden furniture and artwork adorn the rooms and outdoor areas. Food: Excellent and very zingy Thai food is cooked for you three times daily by Ten and Euang, the Villa�s caretakers and chefs, who live in a small village a couple of kilometers away. Ask to try local Isaan dishes such as spicy beef salad with mint or their wicked barbecue chicken with papaya salad. Make sure to say upfront what your chili factor is! Thai cooking lessons are also included in the price.